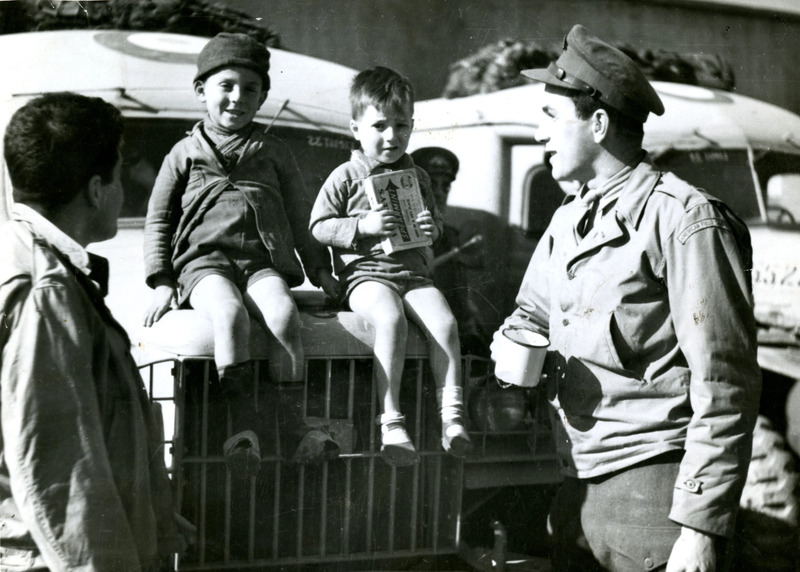 AFS ambulance drivers with two Italian children, one holding a box of chewing gum on February 4, 1944. Photograph by Loftus B. Cuddy, Jr. RG2/001, AFS World War II Photographic Collection. This image cannot be reproduced outside the guidelines of United States Fair Use (17 U.S.C., Section 107) without advance permission from the AFS Archives. The Allied forces in World War II launched an amphibious landing in the areas of Anzio and Nettuno on January 22, 1944, against German forces during the Italian Campaign in what’s referred to as “Operation Shingle.” Despite the initial and successful element of surprise, the Allies were unable to quickly consolidate and send reinforcements for an offensive attack, and the Battle of Anzio against the Axis powers dragged into the summer months. Two American Field Service (AFS) ambulance sections of D Platoon, 485 Company, were assigned to take part in the amphibious landing. The drivers practiced loading and unloading ambulances from tank landing ships and waterproofing their ambulances prior to the operation. The sections were joined by additional AFS ambulance drivers after landing and throughout the ensuing battle, all helping to evacuate the high number of casualties. The photograph depicted above features two Italian children, one holding a box of chewing gum given to him by AFS ambulance drivers Bernie Curley and Richard Decatur. The photograph was taken by fellow ambulance driver Loftus B. Cuddy, Jr. near the beachhead established in Anzio. The two children were found wandering along the beachhead, and were later taken to a safe camp where civilians who were caught in the invasion of Anzio waited until they could be evacuated.